Every once in a while, you get an iconic place that people just seem to have heard of, or associate a town or city with a certain building or structure. In Paris it would be the Eiffel Tower, New York the Statue of Liberty, and Agra has the Taj Mahal. Well Kerikeri has the Stone Store, the store itself is unimpressive to European visitors who often live in building older than the Stone Store. What is impressive is the location, the friendly welcome, and the feeling of stress release. Somehow you just feel right at ease when visiting the Stone Store. 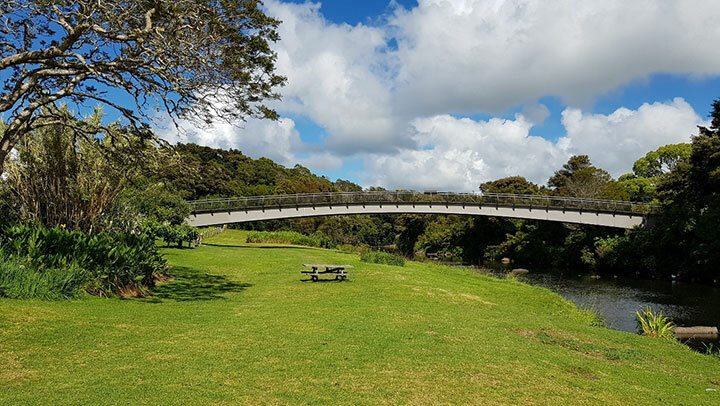 It is located at northern end of Kerikeri Road (your Epic Rentals representative will be able to help you with directions). Years ago, traffic used to have to pass the Stone Store to travel north, now there is a bypass for the majority of traffic and only the tourists and visitors alike venture down to the store. There is plenty of parking down the bottom outside the Stone Store, if you are venturing down there please be courteous when parking as it can be busy over the summer months, and further parking on the right as you head down the hill. There is also a great Café called The Pear Tree right beside the Store. Venture inside the store to view the nick nacks inside or just buy an ice-cream and enjoy the view. If you have a bit of time on your hands and don’t mind a bit of a walk, then you definitely need to go for a bit of a walk around the place. If you are feeling adventurous try crossing the river via the natural rock formations. In summer there is always a heap of kids playing and swimming on, though, and around the rocks. If you’re not quite up to jumping from rock to rock, and risking an unexpected swim. Then the bridge is the way to go. It’s a little longer, not half as exciting, but a lot safer and drier. Once across the bridge it takes you to a beautiful park where you can relax, walk around, feed the many birds that reside there (mainly ducks and chickens), or just sit down and people watch. There is often sport being played in the park, kids kicking balls, runners and people exercising, the list is endless. 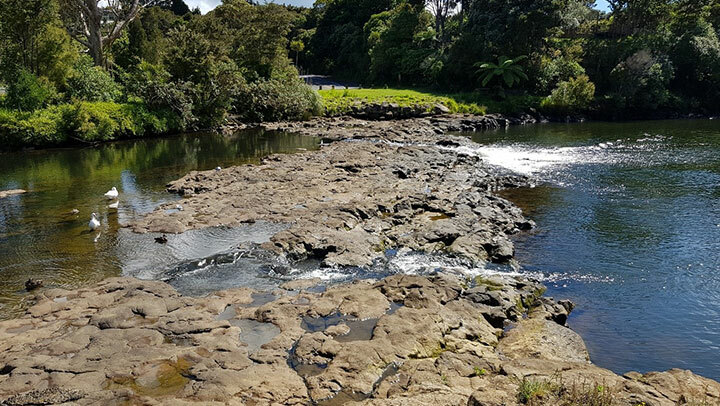 This is also where the Rainbow Falls Track meets the reserve (just stay close to the river and walk away from the ocean) you will soon see the start of the Rainbow Falls Track. If you are fit and able allow about an hour to get there, if not it may take you a bit longer 1 ½ hours maybe. You may want a driver to meet you at the other end if fitness is an issue, just take your Epic Rental Car to the other end of the track and the driver can enjoy the falls while the crew make the walk. 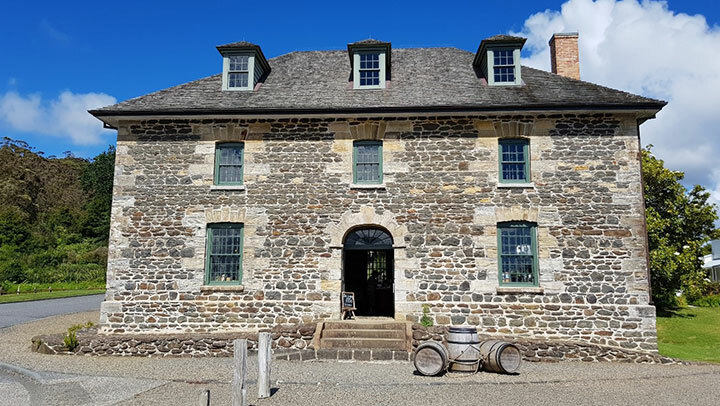 The Stone Store was originally built in 1832 and is made from local lava and sandstone imported from Sydney Australia. It was originally intended to be a trading post for the Missionary Church selling produce to the ships and European goods to the local Maori. This didn’t last long however as European settlers were vastly undercutting the church, and it became unprofitable. It has since been used as a barracks, boys school, general store, and now as a museum and reserve. 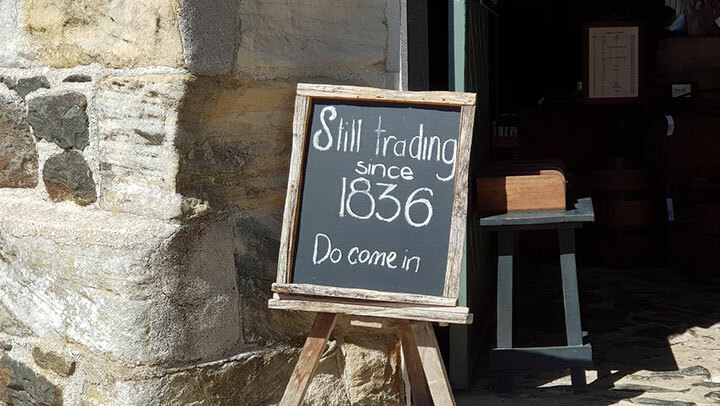 The stone store is New Zealand’s oldest stone building. If you would like to visit the Stone Store in Kerikeri, follow this link www.epicrentals.co.nz or give us a call on 0800 374 2386 (0800 Epic Fun) we would be more than happy to help you get the most out of your trip and Northland as a destination.